I grew up in a family that didn't give a lot of physical affection. Like, not that we never showed physical affection. But my parents weren't real "hand-holdy" kind of people, and while we often did the obligatory hugs or kisses amongst family members, these were not often used to regularly communicate emotions. It is safe to say that "Physical Touch" was definitely not one of our love languages. And Hubby comes from a wonderfully affectionate family. Not overly affectionate. The just-right-amount affectionate. A squeeze on the shoulder or a hold of the hand to drive a point home isn't uncommon. They are just sweet people. As early as the first time I met the extended family, I was welcomed with the Hug Line. That's what I call it, anyway. Whenever we part, everyone stands up and gives each person a hug before they leave. Whether you've met them once or known them your whole life, you get a hug. It's funny, when I compare the two families. My family would more readily give you a head nod or *gasp* a high five before parting ways. My in-laws will hug you just for stopping by. Over the past 6+ years, this is something I've had to get used to. In a good kind of way. Because shortly after marrying Hubby I realized that physical affection is not something I am good with. In that, I am not used to it. I often feel like I fumble it. I hug too quick or too long, or go in for a hug when the other person goes in for a kiss, or just generally feel uncomfortable if I don't know the person well. I just don't communicate that way. Give me a piece of paper (or a keyboard), and I can write my emotions with the greatest of ease. I was made for communicating through words. And sometimes I can even pull out those words in person. Sometimes. In the right situation, like a motivational-speaking "rally the troops" kind of way. But when it comes to telling someone I care about them? That I really love them? I have so many emotions in my heart at all times. Some of them I communicate well. But when they get real, when they are personal and really count, I buckle under the pressure. The mushy-gushy feelings I have just don't translate to real words, or it comes off so completely wrong. This is something I am consciously working on with Hubby. Hubby, the man who comes from a wonderfully adoring and affectionate family, has been so patient in dealing with me, the girl who comes from the stoic if not loud at times family. Our Love Languages are so different, and to meet each other's emotional needs, I know I have to go outside of my comfort zone. I need to hold his hand, snuggle or give him a hug. I love him, so I don't mind doing those things. But the thought, the action, doesn't come naturally. It's in my nature to keep the house clean or get him a thoughtful gift. But he needs to hear the words, "I love you. I think you are great" as much as he needs to feel my love in real life. While I have been aware of my Love Language disconnect with Hubby, I'm only just becoming aware of the emotional needs of my girls differing from mine. Now that Chica is older, she is able to voice her emotional needs more. And I've become very aware recently that she is a physical touch Long Languager (yes, I just made this word up). She likes to snuggle, give you a kiss. She lights up when you ask her for a hug. She loves quality time. And I'm realizing how I've just not been meeting her needs. These needs go outside of my comfort zone. And up until now, I've just been unaware that these are her specific wants. But now I know. And I need to be conscious of the things she needs, emotionally. For some of these things, I might need to go outside of my comfort zone. I know I'll need to be pro-active, because the kinds of ways she needs to be loved don't always come naturally to me. This makes me feel a little frustrated, like I am failing her somehow. But I believe realizing this is half the battle. Now I can work on it and work on loving her better. Do you have a Love Language Dilemma? 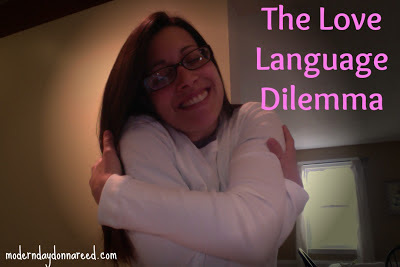 What love languages do you struggle with?